Vindico, a Viant company and digital video ad platform, recently released its 2014 Annual Report, zeroing in on the topic of viewability. Vindico notes that the overall viewability rate of digital video ads was 45% last year, representing only a slight improvement over the 43% rate from 2013. The “improvement” is even less impressive when considering that Vindico was using an even lower bar to measure viewability in 2013. That’s because the Media Rating Council (MRC) did not officially formalize its definition of video viewability until Q2 2014. A video ad is now considered viewable if 50% of its pixels are in-view for at least two continuous second. 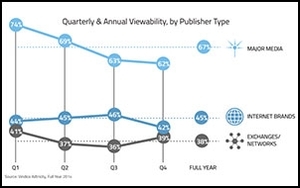 Vindico says that in 2013, it measured the viewability of video ads the same way it measured display ads -- i.e. one second of being in-view, not two. “The last quarter before the new MRC rule, Q1 2014, showed the highest viewability rate at 47%, only two points higher than Q2 2014, the first quarter with the stricter rule applied,” wrote Vindico. If anything, this slight dip shows that the “stricter” guidelines (asking for two seconds, instead of one) has a marginal impact. Networks and ad exchanges fared even worse than the market at large, as only 38% of video ads bought and sold this way were viewable in 2014. “Major media” sites -- i.e. the New York Times, Hulu, CNN, NBC and others -- recorded a 67% viewability rate in 2014, while “Internet brands” checked in at 45%. Vindico considers Internet brands as “Web site brands that evolve from standalone digital content offerings,” including MSN, Yahoo and YouTube. In Vidico’s 2013 report, over half of network and exchange video inventory received a “D” or “F” grade, but over 20% received an “A” or “B.” This indicates that 2014 saw less great video inventory on networks and exchanges, less horrible inventory, and significantly more mediocre inventory. Vindico’s video ad serving tech is accredited by the MRC, and the company says it’s “actively seeking” viewability accreditation as well.